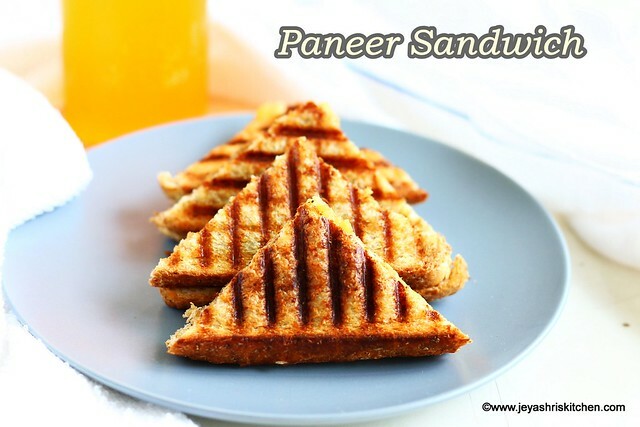 Paneer Sandwich recipe with video and step by step pictures, Paneer cubes marinated in Indo Chinese style and made with a creamy potato spread, a perfect party snack and a lunch box recipe too. I have tried this recipe few times from a cook book which i bought many many years back. Recently when i was arranging my shelf, i saw this recipe again, I have all the ingredients with me and wanted to try for kids. This paneer sandwich is again a super hit at home and kids loved it a lot. Paneer can be replaced with Tofu in this recipe. Do try this recipe at home and let me know how it turned out. 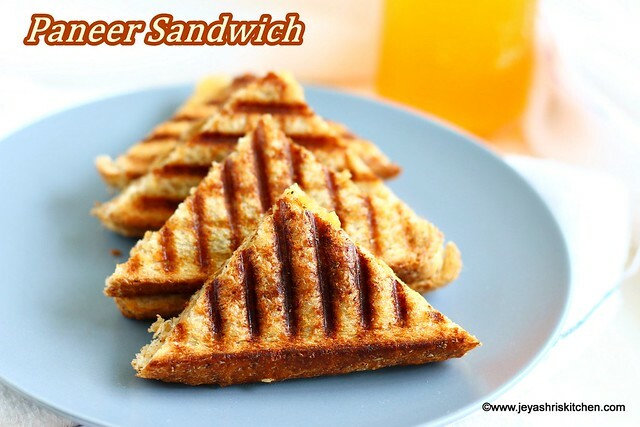 Description: Paneer Sandwich recipe with video and step by step pictures, Paneer cubes marinated in Indo Chinese style and made with a creamy potato spread, a perfect party snack and a lunch box recipe too. In a wide bowl add the paneer cubes. If it is frozen, bring it to room temperature. Add the ginger, garlic, pepper powder, salt and soya sauce to this. Mix well and let this marinate for 5-10 minutes. In a pan add butter and add the marinated mixture. Saute for 5 minutes and keep it aside. Let's make the potato spread now. In a bowl add the mashed potato. Ensure there is no lumps. Add the tomato ketchup, pepper powder and butter to this. Keep a sandwich maker ready. Butter a bread and keep the buttered portion down on the sandwich maker. You can make this on a tawa too. Spread the potato mixture on the top side. Place little portion of paneer mixture on it. Butter another bread on one side. Place the buttered portion up and keep on the top. Cook till it turns crisp and brown. If making on stove top, flip on both sides and cook on a medium low flame. Once done take out and cut them into triangles or squares. Serve the sandwich hot or you can pack them for lunch box too. You can make the potato spread and paneer ready the previous day night and make the sandwich the next day morning for breakfast or lunch box. Sweet potato can be replaced for potato. Paneer Sandwich can be made on stove top too. Saute for 2-3 minutes and keep it aside. 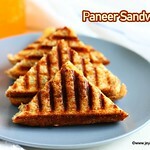 Wow Simple and easy way of making Paneer Sandwich, must try recipe. Damn sure my kid will love it. Let me try it in my home and will leave back the comment that how it turned out for me.